Many tax collectors and bad people came to listen to Jesus. Then the Pharisees and the teachers of the law began to complain, "Look! This man (Jesus) welcomes bad people and even eats with them!" Then Jesus told them this story: "Suppose one of you has 100 sheep, but he loses one of them. Then he will leave the other 99 sheep alone and go out and look for the lost sheep. The man will continue to search for the lost sheep until he finds it. And when he finds the sheep, the man is very happy. The man carries the sheep to his home. He goes to his friends and neighbors and says to them, 'Be happy with me because I found my lost sheep!' In the same way, I tell you, heaven is a happy place when one sinner changes his heart. There is more joy for that one sinner than there is for 99 good people that don't need to change their hearts." So often the chapter divisions in the Bible get in our way. Luke 14 ends with Jesus asking for folks to listen. 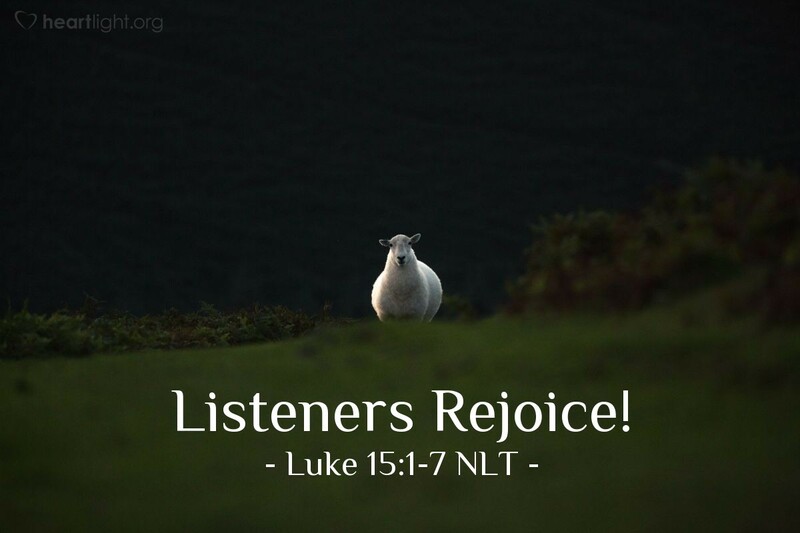 Notice how Luke 15 begins with the sinners listening! They open their hearts! They did it frequently and repeatedly. In Jesus' company, they found the hope of God. While the religiously self-righteous look down on these "despicable" and "notorious" folks, heaven does not! Why? Because God is searching for seekers. God is looking for those who know they are lost and are looking for answers. God is longing to bring home the rebels who know they have blown their life apart and are homesick for the love of God. For every sinner who has longed to return, for every lost soul who has longed to be found, for every rebel who longs to return home, listen and rejoice! God is looking for you. God is longing for you to be found. God is planning a party to rejoice in your repentance, your return, and your restoration. O God of Wonders, marvelous in power and might and generous and gracious beyond our sinfulness, thank you! Thank you for grace, forgiveness, and cleansing. Thank you for the joy of salvation. Thank you for wanting me home. Thank you for the promise of heaven's joy. In Jesus' name. Amen.